Monday,​ March 25th 2019 Frank Carillo and Eddie Seville visited the Homestead studio in Heemstede, the Netherlands. Frank Carillo is an American guitarist and songwriter. He is known internationally for his contributions to Peter Frampton, Cheap Trick, Van Halen and Tom Petty & The Heartbreakers. In 2004 Carillo formed his band Frank Carillo and the Bandoleros, consisting of five people, with whom he has now produced two CDs. In the Netherlands, Carillo is primarily known for his collaboration with Golden Earring guitarist George Kooymans and his contribution to the first album of Anouk. Eddie Seville is an American songwriter and multi-instrumentalist, best known as the voice and creative force behind the popular East Coast, roots rock band ‘the Steel Rodeo’. As a solo artist, a noted member of Frank Carillo’s Bandoleros and a frequent “special guest”, he has performed throughout the continental US, Canada, Europe and the Virgin Islands. 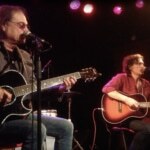 In March 2019 Frank and Eddie had an acoustic tour through the Netherlands. They both played Homestead guitars and were remarkably satisfied with the guitars. During each concert, they indicated that they fell in love with Homestead guitars. Frank took one Homestead guitar back with him for his American gigs. Meanwhile, Homestead is building two new guitars for both artists. During their visit to the Homestead studio “De Kluis” (The Vault) Frank and Eddie played five songs. This is one of the recorded songs.